Are you interested in chicken keeping and need to know how to get started? 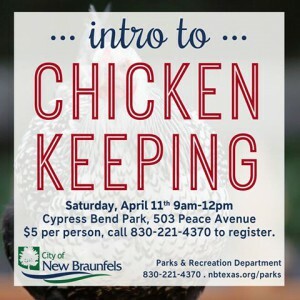 Join us for a Chick workshop at Cypress Bend Park on April 11, 2015 9am-12pm to learn the basics of keeping and caring for chickens. New Braunfels Feed & Supply will provide information on how to raise healthy productive chickens. This event is $5 per person. Call 830-221-4370 to register. This entry was posted on Thursday, March 26th, 2015 at 1:51 pm	and is filed under Events. You can follow any responses to this entry through the RSS 2.0 feed. Both comments and pings are currently closed.